Housing plans got underway in Ullapool. The first of 400 homes in the Highlands got underway this week when site works opened in Ullapool. 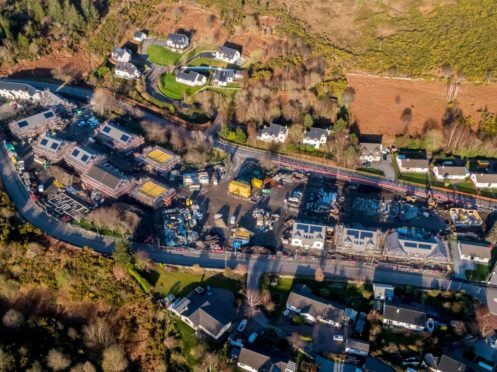 Highland Housing Alliance (HHA) has revealed that onsite building construction started at Glenfield, with 49 properties becoming available this winter. Cairn Housing Association (CHH) confirmed that the development was the first of more than 400 houses it hopes to create across the region. The mixed development at Glenfield Park, on the site of the former Glenfield Hotel, will see one, two and three-bedroom homes for sale, mid-market rent and social rent. Six mid-market properties will be available for rent from HHA Homes; eight affordable homes will be on offer from Cairn Housing Association with a further 20 affordable homes available from The Highland Council. 15 properties on the development will be for open-market sale. Simon Campbell, property investment coordinator for Cairn Housing Association added: “We are delighted to work with HHA, Highland Council and the Scottish Government to build new homes in Ullapool, which will be a great addition to the village. “Demand for good quality, affordable social housing continues to grow and our ambitious plan to build 400 homes over the next five years will go some way to meeting that need”. HHA chief Executive Gail Matheson said: “It is great to have the opportunity to develop mid-market rental homes in Ullapool, targeted at people living and working in the area. “The rents for these homes will be below current private rental levels for similar properties in the area. Tom MacLeod, managing director of Compass Building and Construction Service said: “We are delighted to be working in partnership with The Highland Council, HHA and Cairn Housing Association to deliver a much-needed development in Ullapool. Councillor Allan Henderson, chairman of Highland Council’s Environment, Development and Infrastructure Committee, said: “The village has been crying out for more affordable accommodation.